At Hunts Cross we believe that sport plays an important part as it contributes to the health and well-being of our children. Sporting excellence and participation, alongside strong cultural opportunities, go hand-in-hand with academic standards. The Government is determined to secure a significant and lasting legacy from the very successful 2012 Olympic and Paralympic Games that were held in London. In order to achieve this and improve the provision of PE and sport in primary schools, additional funding of £150 million per annum has been made available for the academic years 2013-17 and has continued into 2017/18. We have used the Sports Funding to purchase the Enhanced membership of the Liverpool Schools Sports Partnership, which, alongside our own schools actions, has enabled us to strengthen and improve our provision in a variety of ways. To employ a specialist PE sports coach for one full day to plan and deliver high quality games lessons from Reception to year 5 throughout the year. · This specialist PE coach works alongside school staff in a CPD role to develop quality teaching of games. · To provide cover to release teachers for professional development in PE and sport. · To provide transport for sporting events and competitions off site. · To provide training for Play/Sports Leaders to work alongside younger children at lunchtimes to provide a more active and healthy lunchtime. · To attend sport competitions at citywide levels increasing pupils’ participation in competitive sporting events. · To provide funds for the swimming "Top Up" program to enable Year 6 children to achieve 25m. 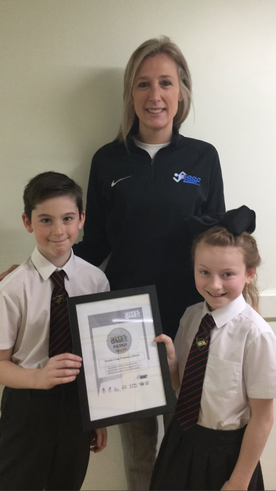 As a result of the work the school is doing both curricular and extra–curricular, the school has been awarded the Silver Sainsbury’s School Games Mark. In the forthcoming academic year we are aiming to achieve either Silver or Gold. A wide range of activities are delivered in school which aim to engage and inspire all children. We are also committed to ensure that all KS2 children receive at least 2 hours per week of high quality well-planned PE. KS1 children receive at least 1 hour per week. Over the year each child will participate in games, athletics, dance and gymnastics lessons. Opportunities are also planned for swimming in Years 5/6.As in previous years, we will be taking part in water polo competitions and galas. PE and Sport has a high profile in our school and permeates many aspects of school life. In Hunts Cross we promote active and healthy lifestyles across the curriculum and staff are creative in planning physical activities across other subjects. During our annual residential visits, children are given the opportunity to participate in different activities which may include orienteering, assault courses, high ropes, raft building, high swings, rifle shooting, zip wires, canoeing and games. In the summer term we also hold our annual Sports Day in which we encourage participation of all children and organize competitive races for our more sporting youngsters. The children are in teams and they compete against each other. We take advantage of the Department for Transport’s Bikeability programme ensuring all children in Upper KS2 have the opportunity to be trained in road safety and cycling skills. Our school teams are named after inspirational Olympians – Farah, Simmonds, Wiggins and Ennis. Our Team Captains along with the school council help to plan and deliver additional activities, sports and games. The school is keen to provide a wide range of extra-curricular clubs for children throughout the year which are organised by our teaching staff, sports coach and high quality external providers. We try to cater for all our children’s needs and so ask the children which clubs they would like to see included during the year. 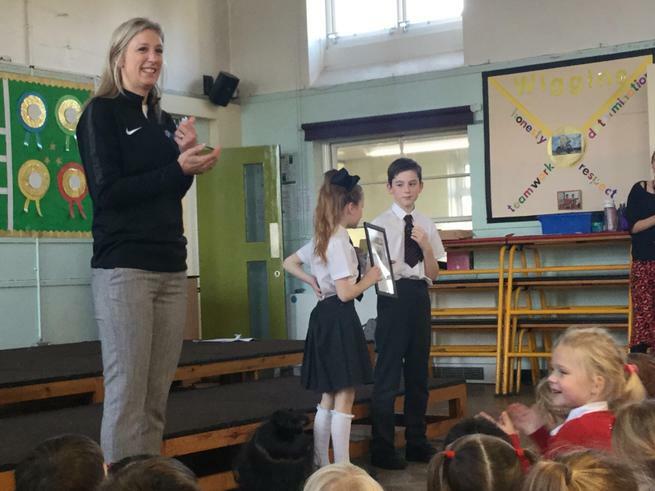 We were proud to be presented with our Silver School Games Mark award during today’s assembly. We could celebrate our achievements as a whole school and say thank you to those at LSSP who have helped us along the way! Those children who have not yet achieved the above objectives will access top up swimming sessions in June 2019.